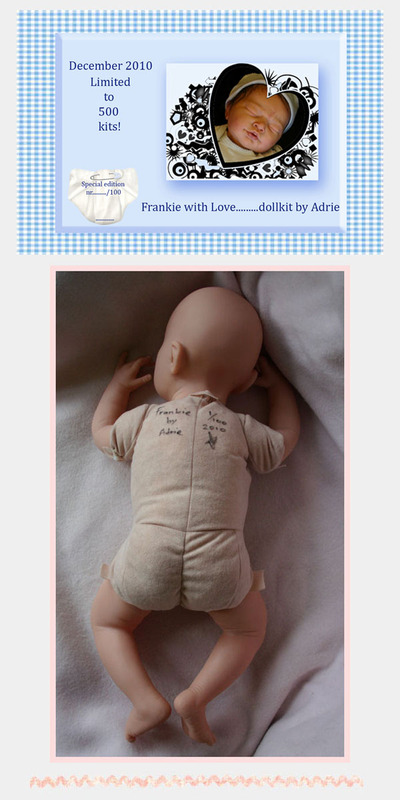 Frankie, Special Edition reborn doll kit from our Tiny Sweetness Collection, our range of smaller kits. Just 100 available. Every kit comes with a signed and numbered newly designed Front Opening body by Adrie herself. This gorgeous sleeping baby will measure 18” and is limited to 600 kits; 100 Special editions and 500 normal kits. He’s made of Chinese made soft vinyl (same as our very popular Barry kit), easy to root and has ¾ arms and FULL legs. His limbs are sculpted just for him and will not be used on future babies, so he and all future babies will be completely unique.